Powers/Abilities: Quick witted, good fighter. History: An established heroine in Majestic City, Catgirl works with Inspector Kerry Lee to protect the populace from criminals such as the Black Empress, a villainous would-be saboteur and blackmailer. After capturing the Empress, Catgirl briefly impersonated the villain to apprehend the Empress' top lieutenant. Comments: Created by Dennis Malcolm Reader. Thanks to Dennis Ray for providing scans of this character's debut story, allowing me to flesh out this entry with images and biographical details. Despite her codename, Catgirl doesn't seem to have anything particularly catlike about her - not only does she demonstrate no powers, but she doesn't even have a cat-themed costume, or even so much as a cat-logo on her outfit. Speaking of her outfit, I'm not entirely sure how she managed to maintain a secret identity, since she doesn't wear any sort of mask. 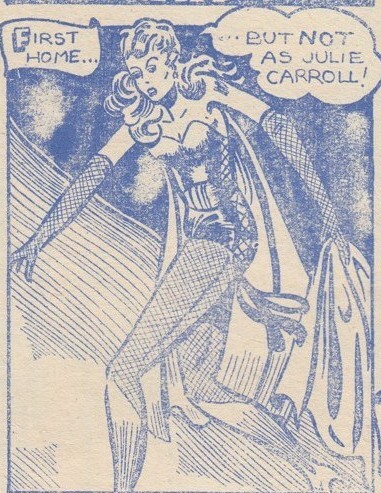 I can only assume that her outfit, tame by modern heroine standards, is so risque and revealing for the 1940s that nobody ever looks at her face.